Ok, I'll make some measures with my luxmeter+intergrating ceilling on my Haiku and post results here. New poster here - I bought one of these light engines for a UV mineral light I am building. My light is a combo shortwave (using SW germicidal fluorescent tubes) and LW using this LED. I can possibly answer some of the questions about the UV output of this LED since UV is the mainstay of my hobby (fluorescent minerals). It puts out a solid 365nm with very little stray visible light. Bright output (not sure how to quantify beyond the specs) - certainly far better than "blacklight" tubes. The visible light output is not even noteworthy (IMHO), and visibly I don't see any significant difference when I filter the output with Hoya U325c UV bandpass filter (passes UV, blocks visible - the standard filter used in mineral lights). The 365nm is "pure" unlike the cheap 5mm LEDs sold by some of the China mfgs (they're just junk, some even peak at 405nm, bandwidths are all over the map, and visible light output is unacceptable (for me)). It is close to 350nm which is the quasi-standard LW in minerals, and far better than "blacklights" which emit lots of blue light and range from 350nm to 390nm. I purchased just the LE - works great, gets hot (installed it in a heatsink in my light). Question? The "3 speed" mode seems very sensitive to switch bounce (it toggles thru the modes occasionally). I am just using a momentary switch to turn it on - any suggestions (other than a cap on the switch)? Let me be the first to say: welcome!! It's indeed a very nice & strong UV-light with little visible spill. To your question I have to ask another question: what kind of switch do you use and what voltage does that switch operate? Although I haven't experienced it to really get warm yet, these LE's usual need good heat-sink. "what kind of switch do you use and what voltage does that switch operate? Although I haven't experienced it to really get warm yet, these LE's usual need good heat-sink." I am using a miniature momentary on/off switch (Alco or similar - 2A, silver plated contacts). With experimentation I find that filtering the output of my 14v to 5v converter solves the problem. (My LE is installed in a handheld lamp powered by a 14.4vdc battery pack). Not being a true "flashaholic" I don't know much about these powerful units y'all are building - but I assume the flashlight case assumes the heatsink's job in your lights? I simply installed a flat heatsink and press fit the unit into it. (Along with a white light LED on a seperate switch). I have found that some minerals do fluoresce best under 400nm light; I wouldn't rule out those cheap Chinese LEDs altogether, though they'd certainly be best as an ancillary light source. They would also be useful for generating enough visible light that your eyes won't hate you when you look at whatever you're trying to light up, with all the hard-UV light reflecting off it and scalding your retinas. The light-engine is designed to be sensitive to slight presses on the switch; if you don't like it, get a stiffer switch. My guess is the problem with your voltage regulation and input voltage to the light engine. Early on, I killed some of these 3S converters when powering them up on a BK bench supply. I don't know if it was due to a spike in the voltage or what. This is really all beyond me. I believe the 3S converter requires some good and clean filtering of input. Batteries of the appropriate input voltage input are not a problem. What is the upper limit on the input voltage the 3S converter can tolerate? Ruby, some sodalite and fluorite will fluoresce nicely under 400nm usually. Ruby in intense under 405nm ("UV" laser diode). Greenland sodalite (my specialty) glows under an ordinary blue lightbulb. But for true beauty (what we FL mineral collectors seek) minimal visible light is required. Note - for every mineral that glows under LW (350nm to 400nm) there are dozens which glow intensely under SW (254nm). Alas - there are no useful LEDs in the 254nm range yet (I have one, but it's a pitiful 50uw, and costs >$200). Scalding retinas - I ain't no doctor but have been playing with UV since childhood, and have been around other UV fanatics quite a bit. LW - such as this diode (365nm) is no worse than sunlight or an ordinary blacklight that kids use to light up their posters. I don't use eye protection with this diode or any of my other LW sources. I *do* use eye protection with UVB or UVC (302nm or 254nm). But of course I also don't shine it into my eyes just as I wouldn't do with any other bright light source. The tirck here is that this is a bright light - you just can't see it. But reflections should not cause a problem. I think you are quite correct. Batteries by default don't genertate spikes. In my application I am using what is essentially a switching power supply (a converter dropping 14.4v to 5v). At power on (pressing my switch) it must generate some noise. Decoupling it with a couple of caps (.1uf) solved the problem. I don't have a scope to verify this, but most likely that's the problem. I believe 5V is the upper limit and that includes spikes. The 3S is good for Li-Ion and that is realistically the upper bound to consider as far as I am concerned. It's the not seeing it that is the problem -- with minimal visible light, your pupils will be wide open, letting all that nice UV come pouring into your eyeballs. It's well-known that airline pilots are at much higher risk of getting cataracts due to higher UV exposure, so while I imagine you're not staring at the reflected UV on your rock collection for hours on end, it's still a bad idea to not wear UV protective glasses if you're going to keep the lights off. There might be different "grades" of UV, but it's all ionizing radiation, and it will all cause damage eventually. My eyes get tired within a couple minutes of shining my UV Mule around in a dark room; you might be used to it, but that doesn't mean it isn't hurting you. pupils wide open isn't that big of a problem, your lenses are the problem. to much uv will give you cataract and that doesn't have anything to do with your pupils. And these leds put out a low level, what was it, 300mW? If you don't put the light an inch away from your eyeball, the reflection of this light won't be worse than a bright day for your lenses. And wearing contact lenses will also reduce UV a lot... 99,9% according to the package. @pirateo40, good to hear you solved the problem! Your lenses are behind your pupils, so yes, if your pupils are wide open, that does expose the lenses to more UV light. But in addition, the retina can be damaged by UV as well, causing it to become insensitive to visible light so that your vision looks blurry even if the focus is correct. I have, by my estimation, better than normal night vision, so I have to make allowances for that, but even with my 99.9% UV blocking glasses on (which doesn't block light from the sides, of course), it still reduces my night vision for a few minutes after I view too much of the UV light, such as if I'm checking my engine bay for fluid leaks. Anyway, regardless of personal experience, UV is always bad for your eyes, so wear protection if you're going to work with it for extended periods of time. I have prescription glasses and they seem to have a pretty high ability to cut UV. Shining the flashlight through my prescription lens objects will almost not fluoresce anymore. If you see the dark room looking hazy (under UV) then that is your eyes fluorescing!! Eyes fluoresce under UV? I'd always wondered, but never had the cojones to find out. Here is a fluorescence shot with Don's Nichia LE. 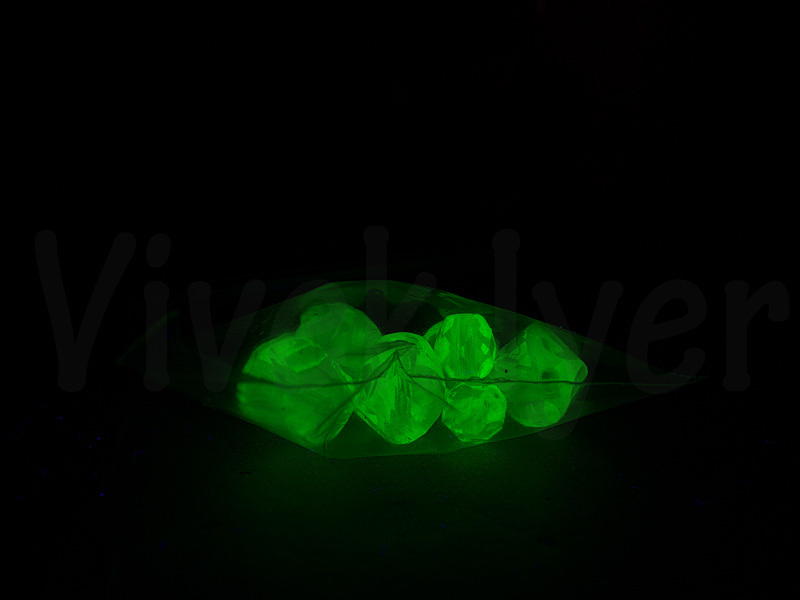 They are pale green to very pale yellow under normal light and just glow under UV (even in daylight!). Uranium doped glass ("press glass", "Uran glas" in German http://de.wikipedia.org/wiki/Uranglas) is an excellent UV indicator. Also, check out LEDmuseum's thread (and his colorful description of Uranium glass. ). They look like candy -- delicious, radioactive candy. Cool! I have some marbles and old glassware made of it. Another application is in the dermatologist's office, as a replacement to the traditional Wood's lamp (peak @ 365 nm), which is used in various aspects of examining the skin. (Little known party trick - if you have erythrasma, your groins, or other affected area, will fluoresce coral red under 365 nm light). I am a complete noob to McGizmo stuff. Can someone tell me if visible wavelength light engines are available to increase the versatility of the turnkey offerings here? A few, yes. Advances in electronic mode-switching have rendered a lot of the older light engines obsolete (except in older lights that still use pressure-sensitive switches to mechanically select brightness), but Don's Aleph System and the Surefire E-Series standard it's based on have been around for many years now. There will be more electronically-switched light engines available in the future, and until then, there are a few custom builders who can make light engines on request. Looks cool. You must have a good UV filter on your camera; on mine the emitter shows up as bright white. I have a good UV filter indeed, also I used spot light metering : measurement was made on the die itself. Did you get the mule? Do you have any pics of the light itself? I'm keen to see what they look like. Thanks. Last edited by Bass; 05-26-2010 at 03:42 PM. Reason: Additional text.